JCU scientists have been the first to calculate how levels of artificial light have changed at all marine turtle nesting areas across Australia, since records began in the early 1990s. James Cook University scientists have been the first to calculate how levels of artificial light have changed at all marine turtle nesting areas across Australia, since records began in the early 1990s. The study revealed that all five of the marine turtle species that nest in Australia had nesting grounds where light levels had significantly increased since 1993. The findings were part of a project by JCU PhD student Ruth Kamrowski, and have been published in the international journal Global Change Biology. Ms Kamrowski said because most animals evolved under natural day-night cycles, modern urban and industrial lighting was disruptive to numerous species, and posed a particular threat to marine turtles. 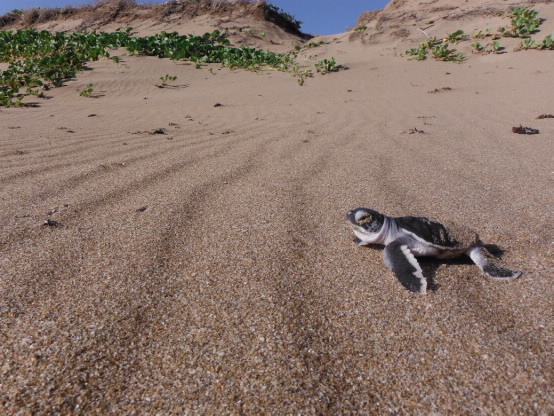 “Hatchling marine turtles rely on environmental cues such as natural light levels to find the ocean,” Ms Kamrowski said. “Artificial lighting adjacent to the nesting beach, such as from housing estates, road lights or industry, can disrupt the hatchlings’ ability to perceive vital natural cues. Dr Mark Hamann of JCU, who supervised the research, said light pollution had long been one of the challenges of marine turtle ecology in Australia. “Although it is well known that turtle hatchlings are disorientated by artificial light, this is the first large-scale study to assess relative changes in light levels at important turtle nesting areas over time,” he said. “Very little light is necessary to disrupt turtle hatchlings, but we studied the changes in artificial light produced by larger sources, including urban settings, coastal development and industry,” he said. The study findings indicated that all five of the marine turtle species that nest in Australia had nesting grounds where light levels had significantly increased since 1993, and east Australian flatbacks were most exposed. “Our findings indicated that the greatest increases in light between 1993 and 2010 occurred at major flatback turtle rookeries in Queensland, including Peak Island in the Keppels, and at minor rookeries north of Rockhampton, including Townsville and Mackay,” Ms Kamrowski said. “This is worrying given the proposed industrial development of the Queensland coast which will only increase light levels further. “Given the importance of the turtle populations which nest here our findings demonstrate that rigorous light pollution management is vital, across Australia, particularly as coastal development continues,” she said. Dr Hamann said a better understanding of trends in artificial lighting may help scientists plan more successful strategies for the future management of development in and around key habitat for marine turtle populations.